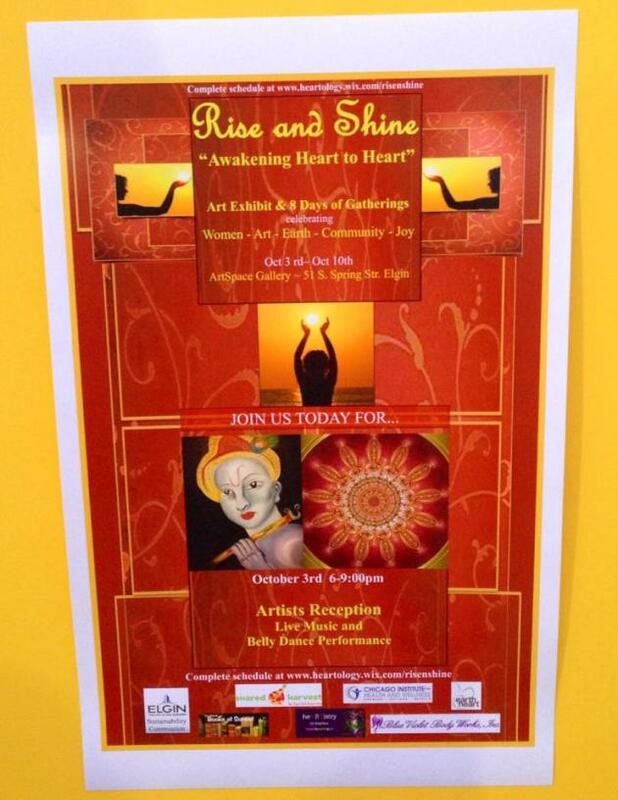 Back in October I took part in an art show called “Rise and Shine: Awakening Heart to Heart.”. Over the last year, I’ve really been striving to put myself and my artwork out there, and I was presented with a wonderful opportunity. About five years ago, this cool little art house opened up a few doors down from the office where I worked. Out in my part of the suburbs, the few galleries/shops you find typically carry the usual paintings of landscapes, vases of flowers, still lives of fruit… work that’s nice to look it, but not anything too unusual, quirky of different. But this place was. It was bright and colorful and interesting and unique. They sold everything from sculptures to paintings to handmade clothing to jewelry. The owners had amazing energy. I fell in love the first time I walked in there and the next day returned with my portfolio. I had work hanging on the walls there for about a year. Eventually the art house closed, but I stayed in contact with the owners via Facebook. One of them, Shelli, send me to an invitation to an event at her farm, a screening of the documentary “Things We Don’t Talk About: Women’s Stories from the Red Tent.” The movie focused on the Red Tent Movement and the desire of women to connect with one another. We may feel so “busy” with life that we become disconnected with each other leading to feelings of emptiness and isolation. The movie suggests that the void that can be filled through bonds of Sisterhood and forging connections with other women. In our busy twenty-first century lives, everyone is so consumed with just “living,” just keeping their heads above the water, that many of us feel that we’re swimming against the current alone. But that it doesn’t have to be like that. Women can find strength in each other. We can share with one another. We can lift each other up. The theme of the movie really spoke to me, because if anyone is horrible about trying to plow through her life without the support of others, it’s me. I’m terrible about reaching out to people when I need help, and even worse about keeping in touch with people who aren’t a part of my everyday life. I’ve drifted away from so many people throughout the years, not even intentionally. No hard feelings, no falling out, no massive arguments or blowouts…you get so wrapped up in day-to-day life; bills, kids, work, errands….then one day you look up and realize that the people you used to talk to all the time have drifted. It’s like being caught up in a riptide, and being so far down the beach that you wonder even if you swim with all your might, if you’ll ever really make it back to where you started from. The idea of sisterhood, of intentionally making the time to meet with other women and sharing your lives, struggles and triumphs, really appealed to me. So even though I have major introvert tendencies (which I really am trying to overcome) and I probably wouldn’t know too many people at the screening, I decided to go. 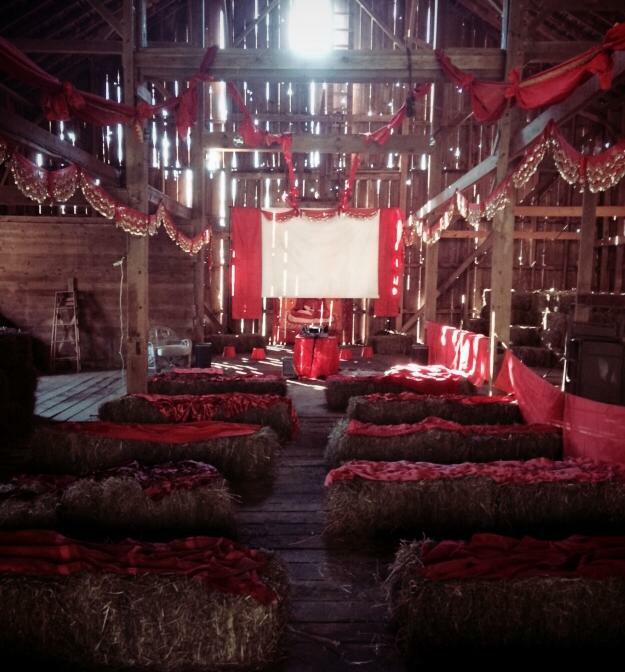 The screening was in Shelli’s barn, and it was beautiful. The atmosphere that she crafted absolutely took my breath away. Yards and yards of rich red fabric draped from the wooden beams, the sweet acrid smell of burning sage wafting through the air, soft music playing in the background as women filed in, taking their seats among bales of hay. It was truly lovely. It felt magical. When the movie was over, I started chatting with the women sitting behind me. They were in the process of putting together a different red tent event in Elgin, which is about forty minutes from where I live. It would be a week-long celebration with different activities taking place each night. 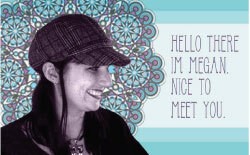 One of the women, Kathleen, gave me her card and said she hoped to see me there. When I got home, I couldn’t get that luxurious, feminine, powerful atmosphere out of my head. So as I’m apt to do with emotions and feelings I can’t articulate very well into words, I created a maṇḍala to try and capture it. I shared in on the events Facebook page. I thought about it some more. A few nights later, I pulled the business card Kathleen had given me out of my sweatshirt pocket, and looked up her event’s website to find out what it was all about. The first thing that caught my attention was that there was going to be an art show, and that they were still looking for artists. The theme of the show revolved around women, motherhood, and Mother Earth. 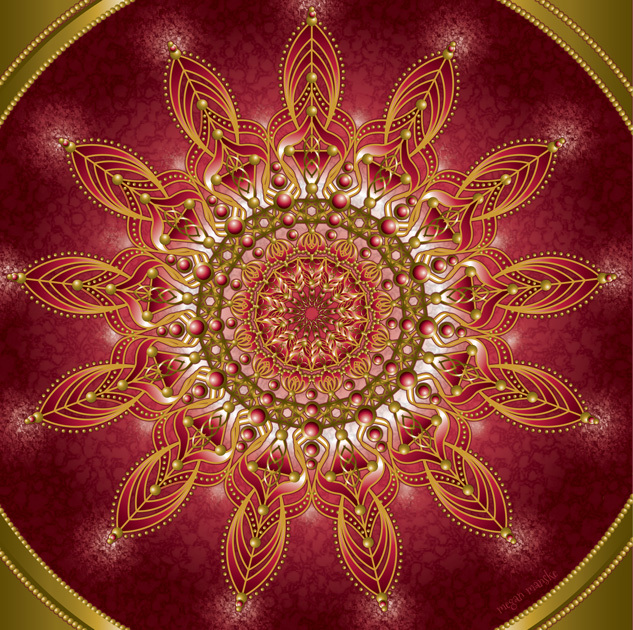 As soon as I saw that, my red feminine mandala immediately sprang to mind, and it just seemed too perfect. I felt compelled to submit my piece, like the Universe had thrown the perfect storm of circumstances my way and was pushing me to do it. I applied immediately with not just the mandala inspired by the movie screening, but this piece as well. Both were accepted. Synchonicity is defined as “The experience of two or more events as meaningfully related, where they are unlikely to be causally related. The subject sees it as a meaningful coincidence.” (Wikipedia). I couldn’t help but feel like this is what happened. All the right people, the right times, the right chain of events falling into place so that I could take part in something that I was really proud of. This is what happens when you follow your intuition and attend events despite the fact you don’t know a lot of people. Magical strings of events. Even for people with introvert tendencies.